Cool off after a fun-filled day of golf, beach, and Carolina sunshine. True to its name, Links Golf and Racquet Club offers two great tennis courts. The resort's playground is a great place to take young kids with lots of energy. Sometimes a nice sauna session is what you need for total relaxation. Challenge friends and family to a game of pool or sit back and relax. Find your own secluded spot to relax among several acres. Don't let the cold stop you from a fun day at the pool – it's indoors. 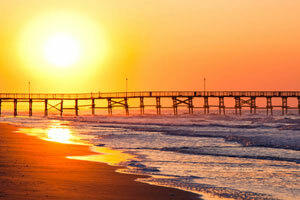 Links Golf and Racquet Club is tucked away from the hustle and bustle of the main drag of Myrtle Beach. It’s a nice quiet resort next to the world-class Possum Trot Golf Course. The beach is a quick drive away, and the resort offers shuttle service during the high season. Better yet, they provide guests with a cabana down by the beach where you can change and store your things. After a long day of golf and beachside fun, come back to your condo put on your swimsuits, apply sunblock and cool off with a nice dip in the outdoor pool or a relaxing sit in the sauna. If it’s cold out, check out the indoor heated pool. You also have access to the resort’s two tennis courts, a basketball court and games in the clubhouse. Two-bedroom townhouses sleep six guests and come equipped with in-suite washer/dryers and a full kitchen for when you want a break from the Myrtle Beach restaurant scene. For groceries, take a family field trip to Food Lion. When you get back to your townhome, bake a batch or two of chocolate chip cookies and let your junior bakers make sure the chocolate-chip to cookie ratio is accurate. Up for a low-key night in? Flatscreen TVs are perfect for family movie night. Pack favorite movies from home, get everyone changed into pajamas and meet in the living room. Put one of the kids on snack duty and another in charge of choosing the movie (tomorrow, have them switch). Attention, shoppers! Links Golf and Racquet Club is less than a half hour away from two popular shopping destinations. Barefoot Landing is home to Barefoot General Store, where you will find specialty food and candy and Myrtle Beach souvenirs. Get a new pair of sunglasses from Sunglass Hut. Visit Del Sol for accessories and apparel that change colors in the sunlight. Surprise the kids with a visit to Build a Bear or Toys & Co. at Broadway at the Beach. Pick out a gift for your four-legged family member back home from Reigning Cats & Dogs. Create your own piece of jewelry at Pick a Pearl. Hungry? Grab a burger at Hard Rock Cafe or seafood at Joe’s Crab Shack. Go for a ride on the SkyWheel. It’s almost two-hundred-feet tall and has the best views of Myrtle Beach. HOUSEKEEPING Housekeeping Is Optional For An Additional Fee. Upon check-in, Defender Resorts reserves the right to inform the guest that a mid-stay move to other accommodations may be required.